You�re viewing our Sausage Maker hot jerky seasoning � makes 160 lbs. 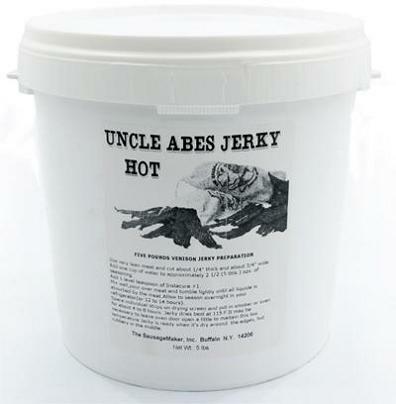 Uncle Abe's popular hot jerky seasoning adds a spicy hot flavor with a special blend of salt, hot peppers and other seasonings to meat. TSM's hot jerky seasoning is a welcome addition to homemade jerky, or use it to season up sausages, chicken, meat patties and more. Contains soy. Directions for use is on each package. Includes Insta Cure� No. 1 (1 lb. per kit). Makes up to 160 lbs. of flavorful jerky. 1 lb. 5 lbs. Please contact us with any questions you may have about our products. 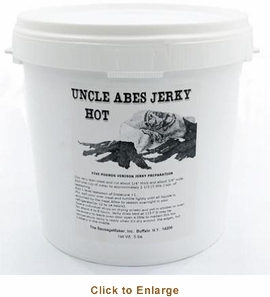 Scroll down to view our Sausage Maker teriyaki jerky seasoning � makes 160 lbs.